Advinstanalytics is considered to be an ad-supported application which places unwanted notifications all over the computer screen. Such thing happens if the adware program injects a rogue extension or plug-in into the infected web browser. Developers use intrusive advertising techniques to promote their adware application and gain benefit from the users. Nevertheless, Advinstanalytics pop-up ads might cause your web browser to crash during browsing sessions. As a result, you will not be able to use your web browser such as Google Chrome, Mozilla Firefox, Internet Explorer, Microsoft Edge, or Safari anymore. However, you can bring your browsers back to their previous states if you proceed with the adware removal. Browser redirecting, frequent advertising, etc. Advinstanalytics virus is an annoying potentially unwanted program which can sneak into the system by using stealth technique. This is the main reason why adware programs sometimes are called “viruses”. Creators spread their apps through other software secretly or just inject them in P2P networks as these sites are very vulnerable due to the lack of protection they face. 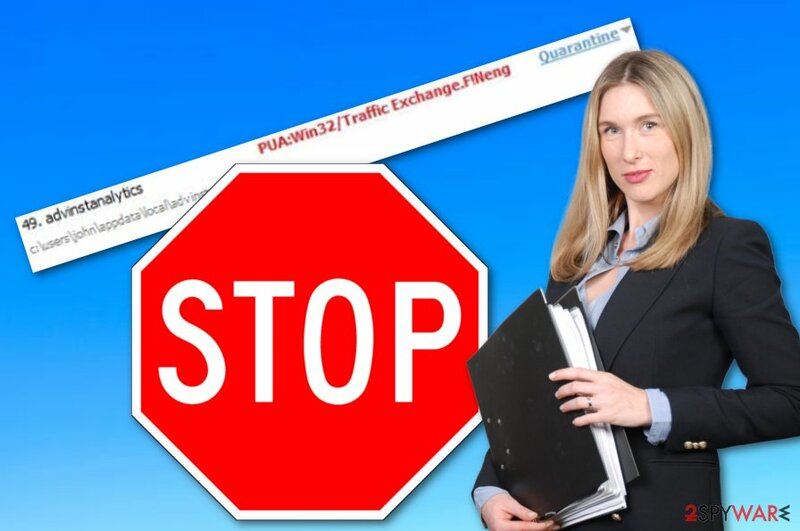 Later on, Advinstanalytics can start redirecting you to suspicious websites. Most of them are developer-sponsored and include adware-related content, distribute misleading adverts, try to convince users to purchase useless products, and so on. However, by accident, you can land on a potentially dangerous web page where malware might be hiding. This way your computer system might get infected with a Trojan horse, ransomware, or other dangerous cyber threat. an increasing number of ads is bothering you while performing browsing sessions. You can remove Advinstanalytics virus manually or automatically. For the automatical purposes, we first suggest using a computer tool such as Reimage to detect the adware program or content that is related to it. This way you will be able to get rid of the PUP permanently. If you are keen on proceeding with the elimination on your own, we advise taking a look at some fixing steps we have provided below this article. 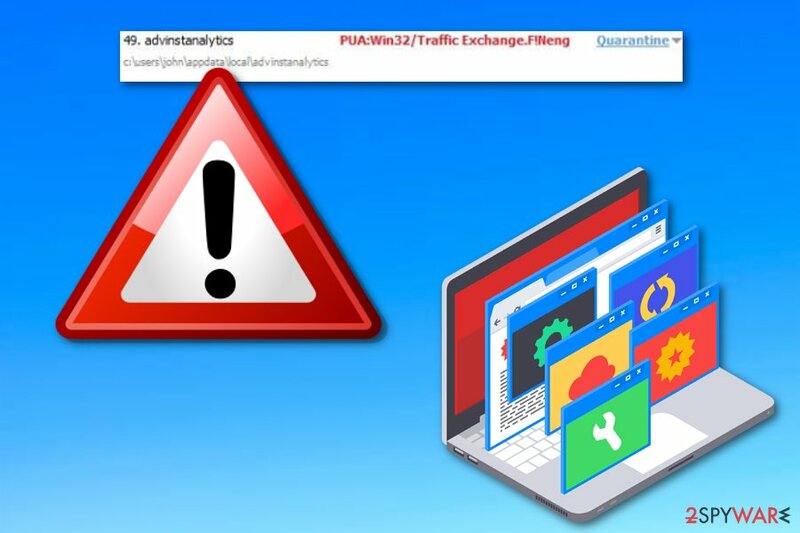 However, all activities mentioned before are not the only reasons why you need to remove Advinstanalytics adware from your system. This potentially unwanted application also has another annoying ability – data collection. Gladly, this adware does not seek your personal information but it can spy on your browsing activity, track down your browsing sessions, and everything about your Internet surfing habits. Adware programs have many distribution techniques, however, the most popular ones are through unprotected websites such as P2P pages or by installing secretly with regular programs. According to cybersecurity experts, developers use a deceptive marketing technique called “bundling” to spread their rogue applications. This adware distribution method has been considered the most popular one. However, you can prevent adware applications from entering your computer system silently. Use only original program downloaders/installers to avoid secret infiltration. Moreover, we suggest selecting the Custom/Advanced installation mode in your browser as it will not allow any rogue content to slip into the system unseen. Of course, you always have to be careful while choosing which apps to install, always investigate them before deciding to download to your computer. Additionally, various unprotected websites can easily spread potentially unwanted programs. Third-party websites, including free torrent downloading sites, often lack recommended protection. Adware-related content can come injected into hyperlinks or adverts that appear on unsafe websites. With clicking on such content you increase the risk of catching adware, or any other potentially unwanted program, infection. Sometimes, even malware can be spread by these ways. You can get rid of the adware application very easily. To remove Advinstanalytics virus, all you need to do is download and install a reputable anti-malware program. Make sure you choose an expert-tested one, otherwise, the elimination process might not bring wanted results and the adware program might still remain in the system waiting for its turn to show up again. Advinstanalytics removal requires some attention from the user. So, if you choose to eliminate the rogue cyber threat on your own, note that you will need to clean your web browsers such as Google Chrome, Mozilla Firefox, Internet Explorer, Microsoft Edge, and Safari. Search for rogue browser extensions, plug-ins, and add-ons in your infected web browsers. Here, look for Advinstanalytics or any other recently installed suspicious programs. Wait until you see Applications folder and look for Advinstanalytics or any other suspicious programs on it. Now right click on every of such entries and select Move to Trash. When in the new window, check Delete personal settings and select Reset again to complete Advinstanalytics removal. Once these steps are finished, Advinstanalytics should be removed from your Microsoft Edge browser. Here, select Advinstanalytics and other questionable plugins. Click Remove to delete these entries. Now you will see Reset Firefox to its default state message with Reset Firefox button. Click this button for several times and complete Advinstanalytics removal. Here, select Advinstanalytics and other malicious plugins and select trash icon to delete these entries. Click Reset to confirm this action and complete Advinstanalytics removal. Here, select Extensions and look for Advinstanalytics or other suspicious entries. Click on the Uninstall button to get rid each of them. Now you will see a detailed dialog window filled with reset options. All of those options are usually checked, but you can specify which of them you want to reset. Click the Reset button to complete Advinstanalytics removal process. ^ Potentially Unwanted Application. Trend Micro. Virus info. ^ Viruset.no. Viruset.no. Spyware news. This entry was posted on 2019-01-31 at 07:09 and is filed under Adware, Viruses. You can quickly scan the QR code with your mobile device and have Advinstanalytics manual removal instructions right in your pocket. How did you remove Advinstanalytics?